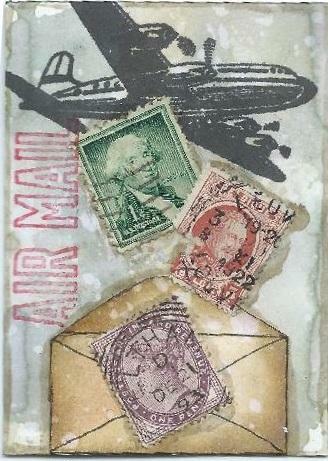 Description 1: Air Mail: For Nancy, theme of postage stamps. 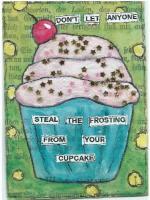 I used Distress Inks for the background and envelope, I sketched and fussy cut the envelope and used some old stamps falling from the Tim Holtz stamped plane. I know some of the stamps are from the '20s. 2: Aye Aye: For Allegrae, theme of sailors. I used text from an old American History book for the background and colored it with acrylics then edged it with two different Archival Inks. I also used a compass rose stamp for the two corners. (Not that you can tell, but the background text and the quote were from a description of an early American naval battle.) I then collaged the photo and background paper. 3. Cupcake: For JudyLee, theme of cupcakes with a quote. I sketched the cupcake (so proud of it, because I don't draw well!) and used water soluble crayons over old German book text. For the frosting, I mixed star-shaped glitter with gel medium and spread it onto the card. NOTE: The glitter is thoroughly mixed into the gel medium and it won't fall off. 4. Fairies: For Mwilding, theme of fairy(s): I glued down paper with music notes and then layered Infusions pigment powder mixed with a bit of gesso. The girls and their wings are from a free photo site (Magic Moonlight). The branches are die cuts and then I embossed more branches at the top and bottom. Umm! I smell old paper!